You may be aware of Glasgow City Council’s bid for funding to Transport Scotland’s Community Links Plus competition with the Woodside Mini Holland bid. http://www.sustrans.org.uk/scotland/communities/community-links-plus-design-competition. The competition was seeking exemplar projects that promote walking, cycling and public space. Glasgow City Council submitted the project bid last year and were up against 37 other national bids. Woodside Mini-Holland was announced as a winner in November 2017. The project is now known as ‘Connecting Woodside’. 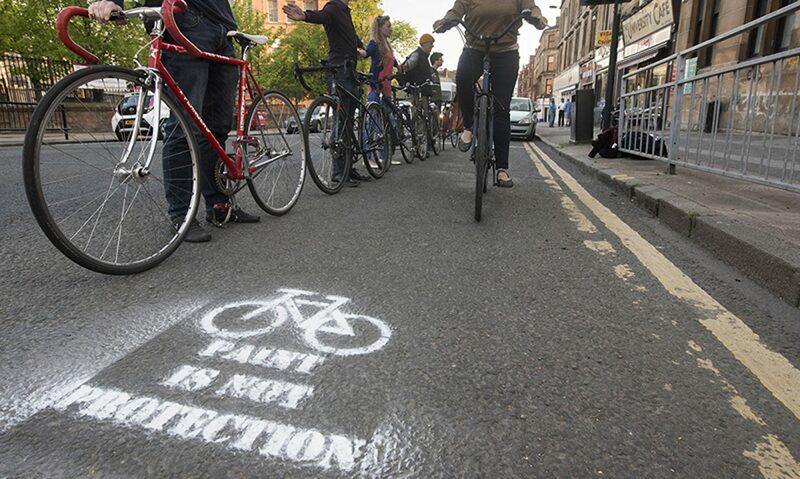 To follow up consultation undertaken throughout the last year GCC and Sustrans will be holding a public walk-in engagement event with a supplementary online consultation to gather further comments on specific sections of the project. Information and an online survey will be available from the 19th June for a period of 4 weeks. The online consultation tool will be available at: www.glasgow.gov.uk/connectingwoodside. Please enter as many comments on the map as you would like e.g. ‘I would like a crossing here as it is difficult to cross’. The website will remain open for comments, however the closing date for consultation responses will be the 17th July. It all looks very exciting so do please look at the plans, get yourself along next Tuesday if you can and respond to the on-line consultation. Previous PostPrevious Friday is Car Free Day for Braeside Street! Next PostNext Councillor Bike Tours – your help please!